Home CultureWho Is Filippo Mazzei? It’s a refrain familiar to all Americans, and a philosophy at the core of our national identity. But do we know where these words came from? Of the many figures who sat beside Thomas Jefferson as he declared America’s independence from Britain, one has been lost to history.Filippo Mazzei, an Italian gardener, doctor, and philosopher – Jefferson’s “zealous Whig” – was brought to Virginia to create the first vineyard in the colonies. Quickly becoming a close friend and neighbor of Thomas Jefferson, the Tuscan turned into a collaborator and political ally. 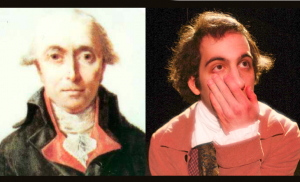 Of all the founders, Mazzei stood out for his eccentric character. But the comedy of his relationship with Jefferson opens up a drama about the revolutionary era: we begin to see that America’s “new government” was sometimes at odds with old lessons. Actor, writer, and theater artist Paul Manganello will lecture on Mazzei’s role in the American Revolution. The lecture will incorporate clips from Manganello’s solo show, Zealous Whig, which he performed to acclaim in 2011.